STALKED: Owen Westwell with a bream he caught down the coast. Snapper continued biting over the past week, with early mornings the most productive. The edge of the channel out from Clifton Springs was a popular location that accounted for a number fish to 7kg. Anyone chasing pinkies for the table should focus on the Alcoa spoil grounds and around the nearby pier. Soft plastics fished deep or pilchard baits will work, and pike, salmon and flathead can all be expected as bycatch. Corio Bay’s inner-harbour fished well for pinkies and flathead caught. Anglers did well either fishing from boats or land-based, with Geelong’s waterfront was a hot spot for pinkies around 30cm. Deeper water around North Shore should be a good area for targeting bigger snapper to potentially 8kg. Casting out from the rocks will put baits in around 8m of water, which is ideal for chasing bigger fish. Offshore, anglers fishing anywhere between Cape Schanck and Anglesea caught mako sharks caught when conditions allowed. Offshore anglers fishing the bottom in 30m to 50m boated gummy sharks and snapper from 1.5kg to 4kg, while kingfish should soon begin appearing in similar depths for anyone ith suitable gear on board. Squid continued to fill anglers’ bags around the Bellarine Peninsula anywhere over weed beds from Clifton Springs to Queenscliff. Casting size 3 to 3.5 jigs in white or a baitfish blue colours worked well, with the Lonsdale Bight still holding the biggest squid. A number of coastal estuaries fired with quality bream. 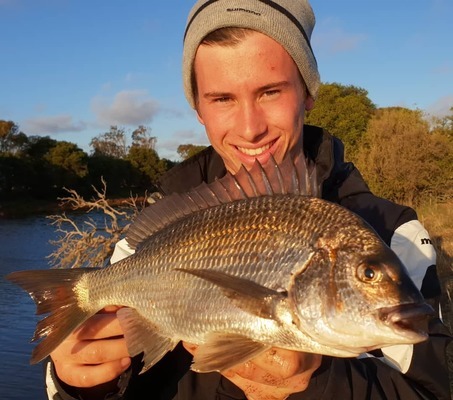 Peri Stavropoulos and Owen Westwell had a ball casting unweighted scrub worms and light soft plastics into snags and pulling out bream to 40cm, with walking the bank to find likely targets more productive than just sitting and waiting for a bite. Carp fishing in the Barwon River kept a number of anglers entertained anywhere between Queen’s Park and Breakwater. Fish to 5kg were grassed, especially when using a light berley with sweet corn or bread baits squeezed onto unweighted hooks. Lake Purrumbete’s new fishing jetty provided plenty of action last week. Anglers fishing mudeye under a float toward the end of the jetty caught brown and rainbow trout, some over 4lb.